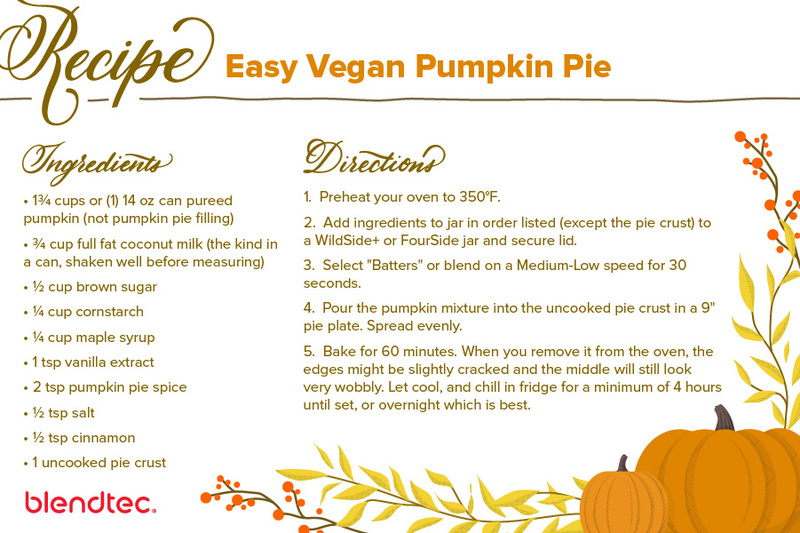 Vegan or not, this pumpkin pie is the perfect tasty end to your Thanksgiving dinner. This recipe comes from Sam at It Doesn't Taste Like Chicken who was kind enough to share it with us. Want to add this recipe to your collection? Click on the recipe card below and print or save! Add ingredients to jar in order listed (except the pie crust) to a WildSide+ or FourSide jar and secure lid. Select "Batters" or blend on a Medium-Low speed for 30 seconds. Pour the pumpkin mixture into the uncooked pie crust in a 9" pie plate. Spread evenly. Bake for 60 minutes. When you remove it from the oven, the edges might be slightly cracked and the middle will still look very wobbly. Let cool, and chill in fridge for a minimum of 4 hours until set, or overnight which is best. Get to know the gal behind It Doesn't Taste Like Chicken who was happy to share this delicious recipe for an easy vegan pumpkin pie filling. We were able to chat with Sam and learn a little bit more about her Thanksgiving traditions and her love of food. Hi, I’m Sam, and I write the blog It Doesn’t Taste Like Chicken, where I share my easy vegan recipes.I began sharing my recipes online, and my how things change... I’m now a full-time food blogger and am currently working on my first cookbook which will be published by Penguin Random House in October 2017. Hop on over to itdoesnttastelikechicken.com to join in on the fun (no rabbit food guaranteed). What is your food “guilty pleasure”? My guilty pleasure is popcorn, I could eat truckloads of the stuff… and often do. What’s one food/ingredient you can’t live without? I can’t live without coffee. I go to bed excited that I get to have that first cup of coffee experience in the morning all over again! Who are your cooking influences? I grew up in a meat-eating foodie family, so as a vegan, I am always inspired by non-vegan recipes. I’m always dreaming up ways to veganize dishes, and use vegetables in unexpected ways. What is on your food bucket list? There are over 20,000 edible plant pieces in the world, but the average diet is mostly made up of only 20 of those! How boring. I want to try all 20,000! Don't forget to follow It Doesn't Taste Like Chicken for details on how to win a Blendtec blender! We're also giving away Blendtec jars at random so post a picture of your holiday celebration and hashtag it with #PartyWithBlendtec. This will be perfect for my vegan mother! Thank you!